We, bishops, women leaders and young leaders, united by a passion for climate justice, gathered during the Season of Creation 2018 at the Good Shepherd Retreat Centre in Hartebeespoort, South Africa. 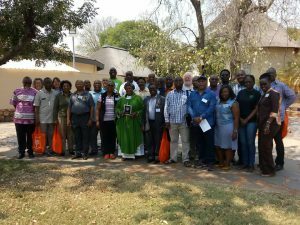 We came from 17 dioceses in 14 African countries and met under the auspices of the Anglican Communion Environmental Network. Our worship, reflection and discussion were guided by the theme ‘Adaptation, Mitigation, and the Witness of the Church in an Era of Climate Change’. Scripture, which beckons us to bear witness, with words and works, to the Good News of the redemption and restoration of all creation according to God’s purpose and will – Creator, Redeemer and Sustainer. The sacramental tradition, which celebrates the gifts of creation for the nourishment of life and godliness, and embodies new creation in Christ. The liturgical tradition of Eucharist and devotion to prayer, which centre us on the death and resurrection of Christ and God’s reconciling love for all humanity and all creation. The diversity of our cultures and contexts reflected in the global Anglican Communion. making budget provision for ecological activities in our Dioceses and encouraging such provision in our Provinces. encouraging budget provision for youth engagement in ecological justice. stop using single-use plastics on our church properties. promoting active networking on environmental issues through twinning with other dioceses and Provinces, and encouraging exchange programmes in order to learn from one another. our Dioceses, Provinces, CAPA, and Lambeth 2020, that Good News for creation and ecological justice be placed at the top of the agenda. All of us are invested in this and all are part of the problem, whether in the north, south, east or west. Our Communion provides opportunity for global witness and resources to tackle this global challenge together.